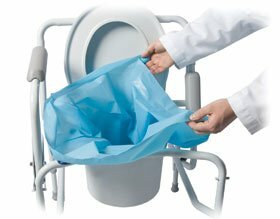 Commode Liners Reduce the spread of infection: no more splashing of urine and feces while staff sprays and cleans dirty commode pails! Waste is immediately gelled and odor neutralized when it reaches the liner, gelling. Sani-Bag commode liners are good for 3-5 uses and are biodegradable! Commode liners seal easily with adhesive strips. Only takes 30 seconds to lift the commode liner bag out, zip, and toss - versus ten minutes to wash a pail.